Or 6 payments of $36.50 What's this? The revolutionary design of this second stage introduces a multiplicity of benefits. The Instinct Octopus is a Sturdy and Durable Octopus that has Superior Resistance to Abrasion. The Mares Instinct Octopus Regulator's Side Exhaust deflects the exhaled breath, so that hardly any bubbles crowd your view. Compensating openings in the back minimize the likelihood of free-flows in strong current. The oversized purge button makes it easy to find and easy to use, even when wearing thick gloves. The Instinct Second Stage with its Vortex Assist Design (V.A.D.) System: all Mares second stages offer the unique patented VAD system. The air bypass tube conveys air to the mouthpiece creating a swirling vortex with a low pressure area in the center this keeps the diaphragm down during inhalation, giving very sensitive and easy breathing at all depths. Regulator is equipped with Mares Fluid Dynamic Deflector (FDD) that receives and properly directs the airflow from the bypass tube directly to the mouthpiece. The mouthpiece is made of soft hypoallergenic silicone: limiting jaw fatigue and offering a secure fit even in an Emergency Out-of-Air Situation. 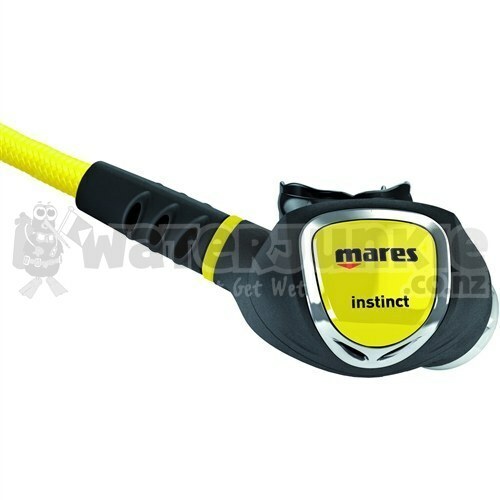 Mares developed the Superflex hose after many years of testing and research. The results achieved far surpassed the tests required by EN250. Hose is extremely light weight and exceptionally soft, guaranteeing the maximum freedom of movement and further reducing jaw fatigue. The Instinct Octopus has a Hi-Viz Yellow cover and hose for easy identification in an out-of-air situation, comes with a 39.4" (100 cm) Superflex Hose for better comfort, weighs 5.29 oz (150 g).